I moved this chair in the corner of the dining room for a bit while I did some cleaning. Now I don't have the heart to move it back. Chris pulling in from work out the window. How can I get mad at that face for jumping up on the furniture? Oh that face is adorable, it makes you want to kiss him all over. I know the feeling I have a chocolate!! Have a great Thursday! Labs are the cream on top of the cake. Their hearts are pure and their love unending. And...their eyes, well...you can't say no to those eyes!!! Beautiful baby you have there!! Looks like he's claimed his space. h He has sure grown. Our bassets hear my husbands car pull in the driveway everynight and meet him at the door. Even if the TV or radio is turned up. Somehow they just know! He looks so handsome in that gorgeous chair! Love that sweet face. He has grown soo much :) Smart & adorable! You need to send this pic to Desire To Inspire for their Pets On Furniture posts. Wasn't he just a pup just a bit ago? He has claimed his space looking for "his guy!" Wonderful dog ! :) He looks very handsome ;) Greetings! I couldn't move it either, he is so sweet! 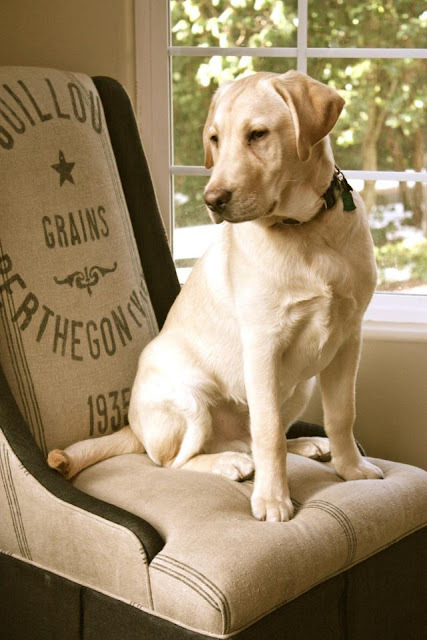 What a handsome boy, oh and a lovely chair too! My two labs don't even need a chair... they just put their paws on the windowsill and stand and watch out the windows! And of course, I can't keep mine off the furniture, or beds, either! Aww I love this! Reminds me of my golden lab. Your dog is so beautiful. I have a chair in my front room that I don't have the heart to move. It is where Guinness watches us leave and come home. It's fun to pull up and see her little head. Funny how they just know when you are back! Awwwww, too sweet. I'd leave the chair there too and give him a treat. Awww, what a sweetie! I'm sure it makes your husband feel great too! Yeah there is no way I could say no to that face!! Plus.. he look good on that chair!! 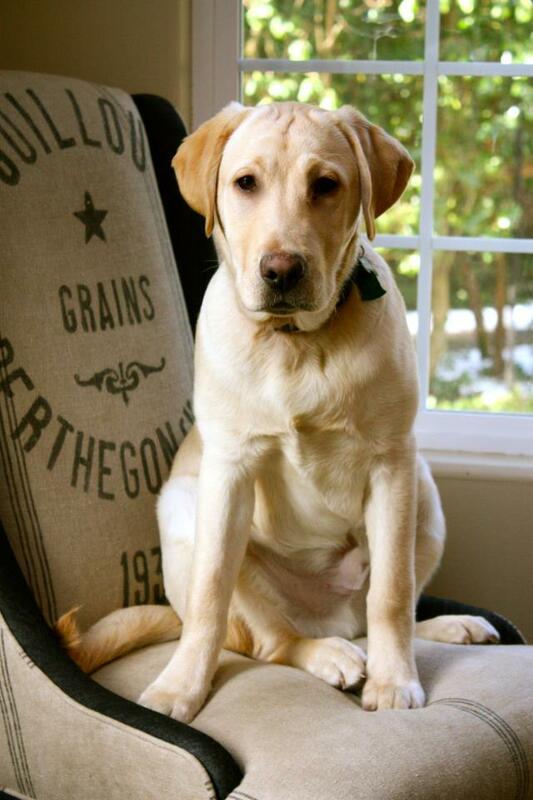 Harley is adorable ~ Labs are the best ♥ & what good taste he has in furniture :-) Love the fabric. I love Harley....he could sit on my furniture any time! I'm looking for a lab or lab mix to adopt. In my heart of hearts, though, I want a white lab. I've been 'dogless' for way too long. So cute! I moved a bench to the window so out Gully could look outside too! What a handsome boy! As much trouble as I would be in bringing home a dog, I could get away with bringing one like that home! Something about yellow labs. Well, I could get away with it with hubby, but the cat, she would be a different story. What a sweetie. I have two chocolates and they have a whole bench to look out the picture window. They hear my car coming and are waiting in the window. And if I don't come straight in I can hear them barking. What unconditional love. He is just perfect! I wanted a yellow lab forever and then a chocolate kinda fell into my lap. I love here dearly, but that face makes me want a yellow! He is the perfect size, I don't like the scrawny ones as much! If he was mine, he'd get anything he wanted with that face! I think I might have a hard time sneaking him out in my purse though, darn! He is adorable! My sweet boy,Cosmo sits at the window whenever we leave. He looks so forlorn as he watches us drive down the street, out of his view. It kills me to leave! Lol!